By now, you know that even the most perfect Halloween costume isn't complete without a coordinating costume wig. Just like your hairstyle can affect your mood and how others perceive you, your costume wig will affect how other's view your costume. If your wig is mismatched or inappropriate it can ruin the entire look of your costume. So, how do you select the perfect costume wig? Well, with all the costume wigs available at HalloweenAdventure.com, it may be difficult. The perfect costume wig is out there, you just have to find it. That's where we come in! As always, HalloweenAdventure.com is here to save the day! (shameless plug) Instead of selecting a costume wig to go with the perfect costume, why not select a costume to go with the perfect wig? In many cases, the wig is impressive enough to stand on its own and the costume becomes the accessory. To show you what we mean, we've taken the liberty of compiling a list of the coolest costume wigs that will make it easy for you to put together a costume to go with them. And, because we just like creating quizzes, we've constructed a quiz to help you decide which one is right for you. 5. Do you have so much money that you could buy and sell everyone in America but not enough to do something about that horrendous hairdo you've been sporting since 1965? Then our number 5 costume wig is perfect for you! Imagine the delight on everyone's face when you wear our "You're Fired" costume wig. Even The Donald is envious of our stunning brown comb-over wig! Costume Idea: A simple business suit. 4. Do you spend your evenings looking for the hottest disco dive in town only to wind up watching reruns of "Welcome Back Kotter" and "Good Times"? Do you pray that the happenin' 1970's fashions will return for a third time just so you won't have to buy new clothing? Then get ready to break out the platform shoes and don our cool Super Fro costume wig. This massive afro may not fit through the door of the dance club, but don't worry-- the party will follow you wherever you go when you're super fly in our super fro! 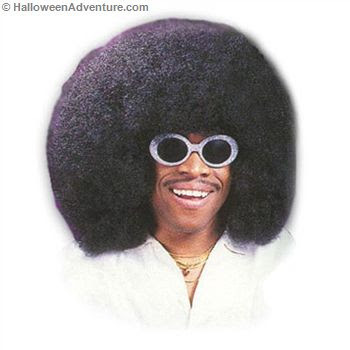 Costume Idea: Bell-bottoms, platform shoes, shiny shirt, and dark shades. 3. Are you ready to party like it's 1985? Do you spend your Friday nights playing old Lynyrd Skynyrd songs on your acoustic guitar only to become frustrated when you can't quite remember the lyrics to "Tuesday's Gone"? Have you mastered every step in the "Achy Breaky Heart" line dance? 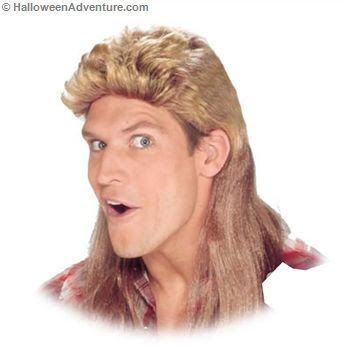 Then prepare to score some chicks this Halloween when you wear our totally rockin' Super Mullet Costume Wig! It's all business up front and party in the back for the coolest dude in town! Costume Idea: Ripped jeans, a cut-sleeved flannel shirt, a white wife beater, and construction worker boots. 2. Are you still rockin' that Poison tat like you were when Bret Michaels was cool, oh so long ago? Do you find that men are more attractive in thick black eyeliner and pink lipstick? Do your teenage neighbors beg you to turn down your hairband music while you're in the front lawn trying to get the Trans Am running again? Then prepare to rock it like it's hot in our cool 80's Rock Star Wig. Not since the days of Cinderella and Dokken have men's hair styles been more feminine! Costume Idea: More makeup than Tammy Faye, acid washed jeans with ripped knees, a black tank top, studded leather jewelry. Do you miss the days of free love and peace rallies? Do you have vivid flashbacks thanks to the truckload of drugs you "sampled" during Woodstock? Do you remember when "Puff the Magic Dragon was a hit"? Then relive your glory days yet again in our totally groovy 1960's Hippie Wig! Let the love pour like cheap wine this Halloween! Costume Idea: Blue jeans, tie dyed t-shirt, and John Lennon shades. So there you have it. Yet again, HalloweenAdventure.com has managed to give you marvelous ideas for your Halloween costume and we did it all without ever mentioning how cool we are or that we've been in business since 1981 or that we have over 100 costume shops all across the country, or that if you purchase $100 or more in merchandise from our massive website that you'll receive FREE shipping. . . . We didn't mention any of that. So, what are you waiting for? Halloween is just around the corner and Halloween Adventure is just a click away. Make this Halloween an adventure with HalloweenAdventure.com!